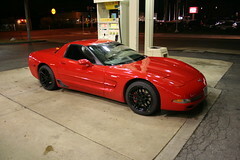 So I took the Z06 to Sears this morning to get another alignment done on the car. I hadn't had one done since 4/3, which was before most of the races and before I screwed the alignment up putting the Koni shocks back on. The toe in the rear was hosed (unsure why), the camber in the front was off as was the caster on the left front corner, which could explain the damage to the tire in Toledo. We'll see how well this new alignment works on Sunday as Dave and I battle it out, our goal is to finish 1 and 2 in index at our local event, me in 1st him in 2nd of course! I've had new street tires for a few weeks now but finally got my new street wheels today. I called around a few places. I tried Autozone and I think they told me it would be $30/wheel to mount and balance the tires. That was a bit higher than I had hoped to pay so I came home after work and tried a service station shop down the street, they told me they couldn't do the wheels because of the size. I then ran to Dobbs in the same shopping center. Dobbs told me it would be $60 for each of the rear wheels and $50 for each of the front wheels. Excuse me? Are you serious, $220 to mount and balance 4 wheels and tires? I don't think so Dobbs! So I called up Sears at Chesterfield Mall, they did the alignment on the car last week (more info coming later in this blog post about the alignment), they said they were open till 8pm and if I got there before 7pm they'd be able to take care of them. I got there just after 6pm, and I think I left the store by 7pm. Yet again they were excellent, mounted and balanced 4 wheels and tires, plus mounted an additional r-comp without balancing for $111. So what do the new wheels look like? They're awesome!